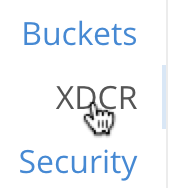 Deleting an XDCR reference ensures that the previously specified remote cluster and bucket are no longer available to receive replicated data. The examples in the subsections below show how to delete a replication; using the UI, the CLI, and the REST API respectively. As their starting-point, the examples assume the scenario that concluded the page Delete a Replication. The reference has now been deleted. The reference has been deleted. If successful, this returns "ok": the reference has been deleted. A replication can be configured securely. See Secure a Reference.